The 4-person Drop-A-Rock stationary climbing tower brings the excitement of rock climbing to your facility! The highly sculpted, realistic surface provides the experience that your patrons are looking for. 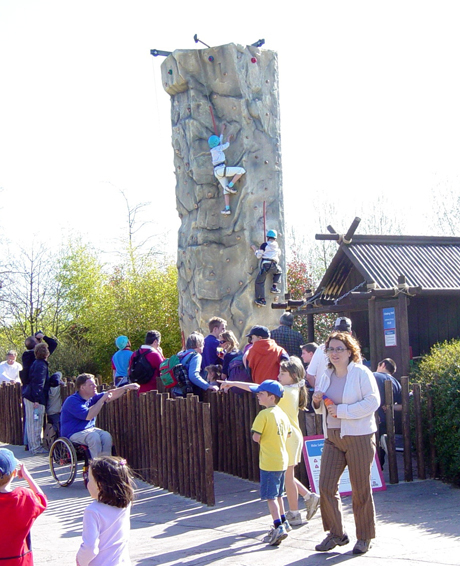 The Drop-A-Rock has four distinct rock faces to keep wall traffic separated and accommodate a variety of climbing skill levels. The Auto-Belay allows one employee to supervise all four climbers at once for maximum through put. The Drop-A-Rock is constructed of a hand laid fiberglass surface and solid steel frame for unsurpassed strength and reliability. It can be customized to fit your location and theme to provide that tailored look. Custom heights are available up to 32′. It can be installed as a freestanding feature or secured to an existing wall.